Bobby Panaro, who denies he has any involvement with the Mafia, has been widely rumored to be the new boss of the Buffalo mob. With the ground covering Joe Todaro and Sonny Nicoletti still fresh, both law enforcement and the legion of mafia buffs who make their home in Western New York have busied themselves trying to figure out who might next head up the tattered remains of the once formidable Magaddino crime family. I’ve been covering organized crime in Buffalo for the better part of 15 years. There are some great stories, lots of colorful characters and some genuinely decent people who have been negatively affected by this kind of speculation. Even the most optimistic observers say the old Magaddino outfit has but 20 made guys left at most, and the majority of them have long since qualified for Social Security. The formerly subservient Utica and Hamilton, Ont., crews have their own problems, with alleged Utica crime lord Russ Carcone still reeling from a 2000 shoplifting bust and the Canadian crew as dead as charity since the assassination of John “Johnny Pops” Papaglia in 1997. Given all the agita that goes along with being a mob boss in a third-rate American city, is it really worth becoming a target both for law enforcement and any two-bit wannabe punk looking to make a name for himself? Just ask the highly respected Papaglia, whose storied career ended when he got shot in the back of the head by a bumbling Irish alcoholic named Ken Murdoch who took the contract for just $2,000 and 40 grams of cocaine. Even Todaro, who the FBI claims was the last official don of the Buffalo family, reportedly gave up his position in 2006 in order to spend more time with his family and enjoy the fruits of the lucrative La Nova pizza business he founded decades earlier. The leading contender for the top spot, Frank “Butchie Bifocals” BiFulco, was alleged to have been a feared enforcer and a capo in the Magaddino organization going back to the 1960s. But he’s currently indisposed, serving a 10-year, 10-month stretch in Club Fed for the 2001 torching of a leased Nissan in the parking lot of Walden Galleria. According to the FBI, Leonard “The Calzone” Falzone took over as acting boss of the family when Todaro stepped down in 2006, after years of serving as an enforcer, hit man and finally a capo in the organization. Falzone has of course denied this. Still, the feds say Falzone was ultimately named consigliere to the Buffalo family in 1987. Aside from a misdemeanor conviction for possession of stolen property in 1971, Falzone had never been in trouble with the law until the mid-1990s, when a federal investigation of Laborers Local 210 in Buffalo put him in the spotlight. Falzone was then an administrator of the local’s $80 million pension fund, and he became a huge target for the investigators. At the time, Buffalo crime circles were lousy with paid informants, stool pigeons and squealers of every stripe. And it didn’t take the feds long to put together a case based on the allegations of these disreputable individuals. The RICO and RICO conspiracy charges set forth in Falzone’s indictment covered a period of time from approximately September, 1985 through August, 1989, during which Falzone was alleged to have engaged in the business of loansharking - charging extremely high interest rates on loaned money. 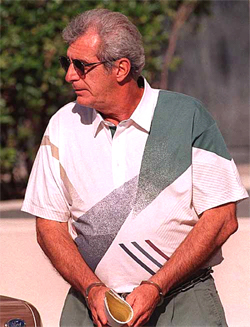 In 1995, Salvatore "Sammy" Spano told a federal jury he needed Falzone's protection and approval to establish a loansharking operation in Las Vegas. His testimony was the latest piece in the case federal prosecutors were trying to build against Falzone, who stood accused of being a renowned mob enforcer who escaped numerous investigations without a conviction. "I asked him (Falzone) if I could move to Vegas and if I could use his name while out in Vegas," Spano said on the witness stand. Also testifying against Falzone were the contemptible Ron Fino and Ronald "Ronnie" Raccuia, a degenerate gambler and onetime Buffalo Common Council Chief of Staff. Falzone was tried in the local media as well. Following his conviction, the Buffalo News editorialists felt vindicated. "Over the years, Falzone had developed a reputation among some as untouchable,” an unsigned editorial read. “No more. This felony conviction cracks his slick reputation for invincibility." The other name currently being batted about as a possible successor to Todaro is that of successful businessman Bobby Panaro, a Las Vegas area resident for the past four decades who spends some time in Buffalo. Like Falzone, Panaro was also ousted from Laborers Local 210 for allegedly associating with organized crime figures. At age 57, he was sentenced in 1999 by U.S. District Judge Philip Pro to 7-1/2 years in prison for conspiring to extort longtime mob associate Herbert "Fat Herbie" Blitzstein, who was slain in January 1997. At the time, Panaro was running an auto dealership known as Good Fellows. "They're giving me 7 1/2 years," he told reporters following his conviction. "For what? What did I do?" A jury acquitted Panaro of all charges related to the Blitzstein slaying, but the four-week trial left him branded a "mafia soldier." "I'm no mob soldier," he said. "I never have been. I never would be." Federal prosecutors had accused Panaro and Steve “The Whale” Cino of authorizing the Blitzstein killing as part of a plot to take over the victim's business activities in Las Vegas. At the trial, prosecutors described Panaro as a member of the Buffalo family and Cino as a member of the Los Angeles mob. "Because I'm Italian?" Panaro asked. "Get out of here." There are people in law enforcement, perhaps, whose jobs depend on whether or not there is a mafia, a “Cosa Nostra,” organized crime, or whatever you want to call it, in the city of Buffalo, New York. And there are other people, lots of them, who study mob politics and machinations in the same way that Civil War buffs examine Sherman’s March to the Sea. But if you ask me, I think Leonard Falzone and Bobby Panaro need to be head of the Buffalo crew like they need another hole in the head.